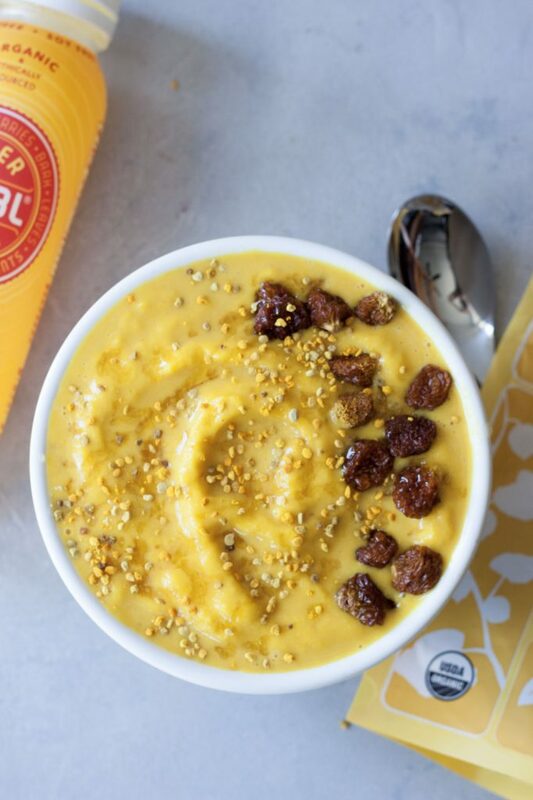 I was holding out until the end of the week to share this 24K Magic Smoothie Bowl but I can’t contain my excitement and I decided to post 3 recipes this week since it’s a special foodie day tomorrow. Hint it has to do with a summer staple fruit! For me though it’s an even more exciting day this weekend as I’ll be at the Bruno Mars 24K Magic concert! I’m excited, so excited it calls for a special smoothie bowl to fuel me this week. Joking of course but I figured since I’ve made crazy smoothie bowls for things like this in the past, aka the Shake It Off Shake, why not? This combo is so good it’s golden, pun intended but it’s healthy too which makes me love it even more! 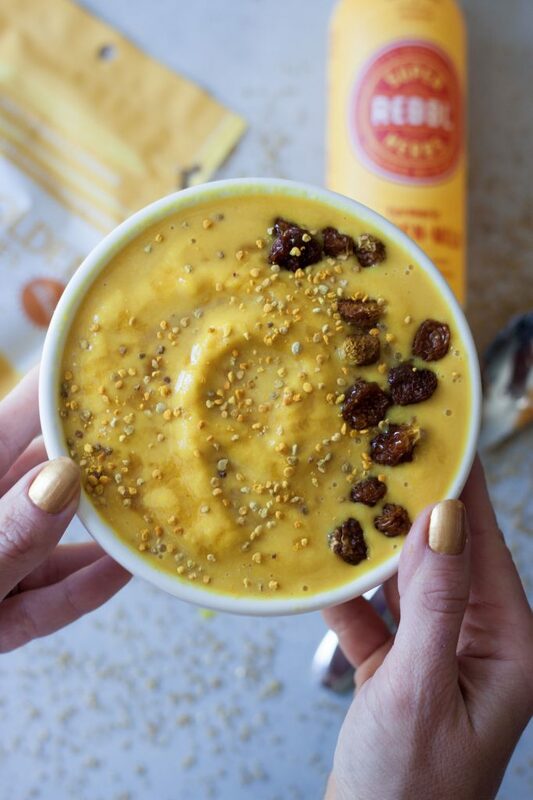 I love golden turmeric milk and so I knew right away my special 24K Smoothie Bowl had to include that. Now for other golden things to add and what combo to make the ingredients and ideas came flowing right away. Nothing out of the ordinary and much like some of the other turmeric smoothie bowls I’ve posted but this one did have to have carrots, if you ask my girls it needed to have 24 carrots for 24K. Haha. Hey I thought it was cute don’t get me wrong but that’s a lot of carrots! I tested it with carrots and juice shot containing carrots. Either works and it’s up to you and what you have on hand. I’m not whipping out my juicer to juice carrots just for a smoothie bowl but if I have Juice So Good The Ginger. So golden turmeric milk, carrots, and the usual suspects frozen pineapple, mango, and banana. For the golden turmeric milk you can use homemade or store bought both are delicious. I usually have a couple bottles on hand for on the go or just in case. Otherwise I try to make my own when there’s time but I also don’t like to make it more than 24 hours in advance. It’s all about what works for life at that moment. I find this smoothie bowl so magical and calming. You can add in vanilla protein for a post workout bowl, enjoy it in the morning, afternoon, or evening for a healthy dessert and self love. 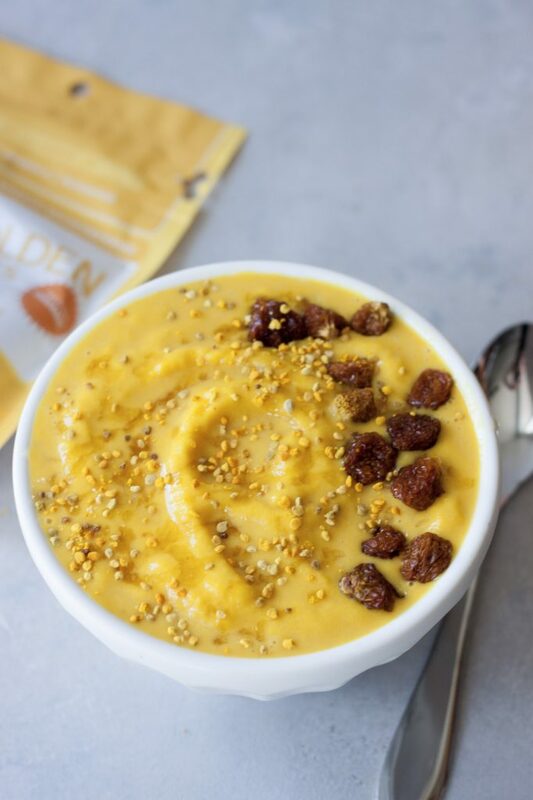 If you want to read a little about the nutritional benefits of turmeric and golden milk check out one of these posts and recipes Bee Sting Latte or Tropical Turmeric Smoothie Bowl. I’ve made it a few times in the last couple weeks, it will probably be on repeat for breakfast again Sunday morning after the concert or if I happen to get to barre Saturday morning I’m thinking I’ll whip this up then before all the craziness and excitement. Yes I’m already planning my food, including stopping for a 24K latte before the show! I get food, fashion well only shoes and purses. So if someone wants to help me figure out what to wear… I bought some cute torn leggings since the Alo ones I wanted before didn’t work and were way too long and the Zella ones had such good reviews I was so happy when I heard they would arrive in time but they don’t fit right as I’m short and one size seems too tight the other is too big. Oh well I’ll just whip up another 24K Magic Smoothie Bowl and hope a magical fashion fairy appears. 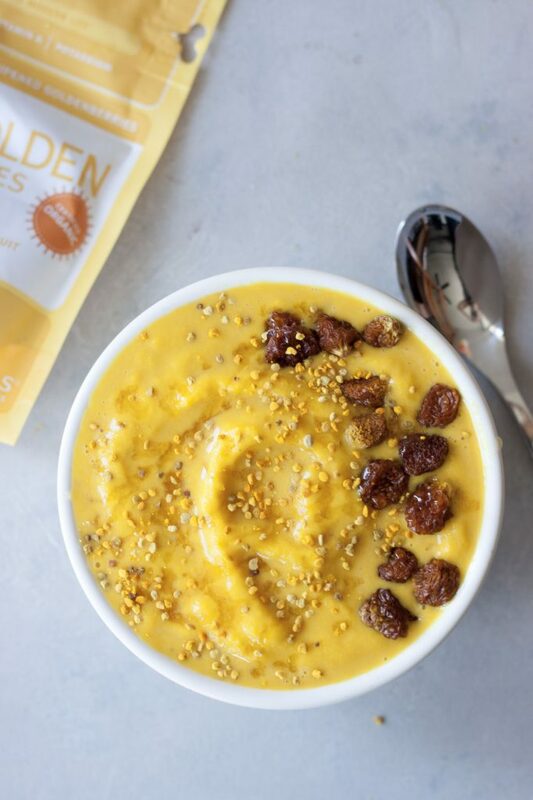 24K Magic Smoothie Bowl is so good it's golden! Whole food nutrition, adaptogens, and flavor come together in this magical bowl. Gluten free, vegan, and a protein option. In a Vitamix, or high-speed blender, blend 1 cup of turmeric milk, grated carrots, and frozen fruit together until thick and creamy, using tamper tool as needed. If more liquid is needed slowly add a little more golden turmeric milk as needed. Pour, of if you got it really thick spoon, into a bowl. 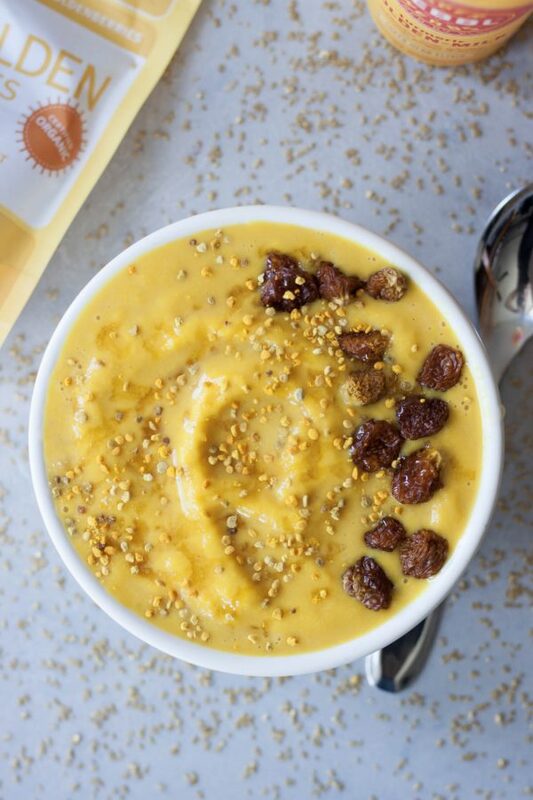 Top with bee pollen, honey, golden berries, and or toppings as desired. Enjoy! If wanting to sub cold pressed carrot juice for grated carrots use 1/4-1/3 cup and reduce the amount of turmeric milk. When wanting a protein option post workout I add 1/2-1 scoop of vanilla protein like Vega Sport or Clean Protein however it does alter the color a bit and it isn't as bright and golden. freaking love the name!! But more than that all the great little ingredients you got in there which are so fabulous for our health! What a gorgeous color in this smoothie bowl! Would love to start my day with this! This is going to be a favorite for sure! That’s an amazing color! I would love to try it.